Watching The Sound of Music on tour is really an opportunity to indulge in comfort entertainment. As Maria and the Mother Superior in the stage production sing about crisp apple strudel in the early part of the first act you realise that it is a Pavlovian response to get all warm and fuzzy about the show. Apart from getting a taste for strudel it will have you recalling when you first saw the movie... Or first dressed up as Ray (a drop of golden sun) to the first singalong. Everyone did that right? This is probably a good thing, as take away fifty years of cultural repositioning the show is a bit of a non-event. Take away the film’s lovely Salzburg locations and the long lingering shots between the Captain and Maria, on stage you have the entire romantic plot condensed into a short speech by infant Gretel to Maria towards the end of the first act. Of course a story about a family of singers that simply leave Austria by train after the Anschluss cries out for a bit of dramatic license. But the book by Howard Lindsay and Russel Crouse lacks much drama and relies on a heavy hand of history to push it along. Its difficult to care about a grumpy aristocratic widow who switches affection from a Viennese socialite to a nun after a throwaway song about adapting to the new regime. Rodgers and Hammerstein’s music seems to make the most of their lovely songs. Again and again. Almost every song is repeated at least twice. It feels less to make a dramatic point and more to fill up time, particularly when most of the action is stuck in front of a grand staircase or in the cloisters of a convent. But gripes aside, this production still manages to surprise with a strong cast, led by Danielle Hope as Maria. Hope previously won the TV show to be Dorothy in the Wizard of Oz. It no doubt requires a resourceful person to carry off the role with the amount of time she is required to be on stage and the and the need to sing both in musical and semi-operatic styles. Her helmet-hair like wig no doubt served to give her an outwardly calm demeanour. 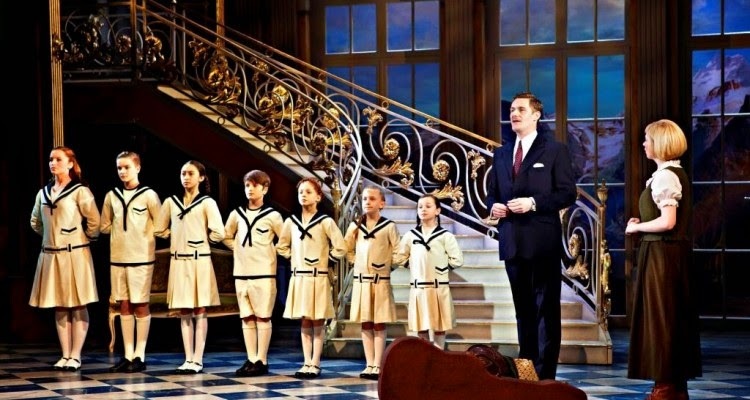 The Von Trapp children perform exceptionally well and are well drilled in imbuing the enthusiasm the piece calls for. There is plenty of musical magic when a boisterous Luke George as Rolf romances Grace Chapman as Liesl in Sixteen Going on Seventeen. It soon turns into a song and dance spectacular complete with jaw dropping high kicks. Jan Hartley as the Mother Superior delivers a show stopping turn singing Climb Every Mountain, which she gets to sing twice. Even with the reverb on full so it sounds as if she is singing it in a tunnel it still is an impressive closing to the first act. Steven Houghton looks dashing and fierce in his velvet uniforms, although perhaps doesn’t match the vocal force of the rest of the cast. Still, even if Edelweiss is sung with unusual phrasing you probably are too busy humming along to notice.